Developer Hammerpoint Interactive has changed the title of its post-apocalyptic survival game The War Z to the less controversy-riddled Infestation: Survivor Stories. If you still recall The War Z, odds are solid that it's got nothing to do with the title's gameplay and everything to do with the firestorm of controversy that sprung up from its Steam debut. In December of 2012 the game hit Steam with a very appealing feature set. Unfortunately for those who purchased the title, it was quickly discovered that most of those features were either not yet complete or simply didn't exist at all. 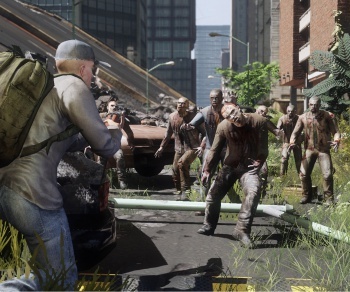 That, combined with Hammerpoint's affection for swiping design cues from the undeniably similar, yet far more beloved DayZ, forced the developer to offer immediate refunds to anyone who dropped cash on The War Z. Well, that is, it would have if Hammerpoint CEO Segey Titov didn't react to this news in the worst possible way: By blaming the fans for the game's failings. Fortunately, Valve stepped in and forced Hammerpoint to return its earnings to anyone who felt mislead by the company, and eventually Titov apologized for the debacle. That was more than half a year ago, and now Hammerpoint has changed the game's title from The War Z to Infestation: Survivor Stories (as you can see on its official website). Is this an effort to distance the title from its ignominious past? Possibly. Probably. Hammerpoint isn't saying, but if you were running a gaming company that was suddenly best known as a group of charlatans who hoped to profit off the stupidity and good will of the general public, wouldn't you make every effort to put all of that behind you? I would, but I also wouldn't have ever built a game with such ambulatory zombies. That's simply not a biologically realistic way to portray mysteriously reanimated corpses.